Abstract. Trees, the most successful biological power plants on earth, build and plumb the critical zone (CZ) in ways that we do not yet understand. To encourage exploration of the character and implications of interactions between trees and soil in the CZ, we propose nine hypotheses that can be tested at diverse settings. The hypotheses are roughly divided into those about the architecture (building) and those about the water (plumbing) in the CZ, but the two functions are intertwined. Depending upon one's disciplinary background, many of the nine hypotheses listed below may appear obviously true or obviously false. 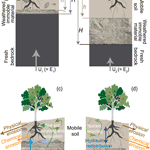 (1) Tree roots can only physically penetrate and biogeochemically comminute the immobile substrate underlying mobile soil where that underlying substrate is fractured or pre-weathered. (2) In settings where the thickness of weathered material, H, is large, trees primarily shape the CZ through biogeochemical reactions within the rooting zone. 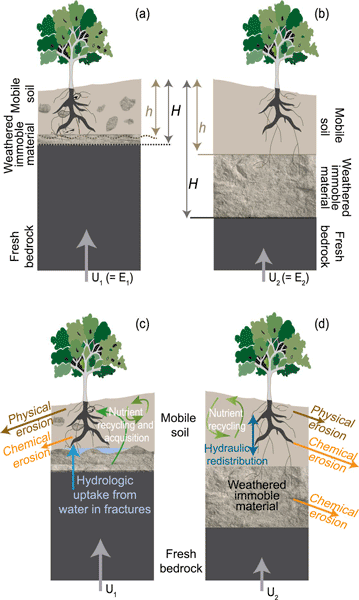 (3) In forested uplands, the thickness of mobile soil, h, can evolve toward a steady state because of feedbacks related to root disruption and tree throw. (4) In settings where h≪H and the rates of uplift and erosion are low, the uptake of phosphorus into trees is buffered by the fine-grained fraction of the soil, and the ultimate source of this phosphorus is dust. (5) In settings of limited water availability, trees maintain the highest length density of functional roots at depths where water can be extracted over most of the growing season with the least amount of energy expenditure. (6) Trees grow the majority of their roots in the zone where the most growth-limiting resource is abundant, but they also grow roots at other depths to forage for other resources and to hydraulically redistribute those resources to depths where they can be taken up more efficiently. (7) Trees rely on matrix water in the unsaturated zone that at times may have an isotopic composition distinct from the gravity-drained water that transits from the hillslope to groundwater and streamflow. (8) Mycorrhizal fungi can use matrix water directly, but trees can only use this water by accessing it indirectly through the fungi. (9) Even trees growing well above the valley floor of a catchment can directly affect stream chemistry where changes in permeability near the rooting zone promote intermittent zones of water saturation and downslope flow of water to the stream. By testing these nine hypotheses, we will generate important new cross-disciplinary insights that advance CZ science. How to cite: Brantley, S. L., Eissenstat, D. M., Marshall, J. A., Godsey, S. E., Balogh-Brunstad, Z., Karwan, D. L., Papuga, S. A., Roering, J., Dawson, T. E., Evaristo, J., Chadwick, O., McDonnell, J. J., and Weathers, K. C.: Reviews and syntheses: on the roles trees play in building and plumbing the critical zone, Biogeosciences, 14, 5115-5142, https://doi.org/10.5194/bg-14-5115-2017, 2017. This review represents the outcome from an invigorating workshop discussion that involved tree physiologists, geomorphologists, ecologists, geochemists, and hydrologists and developed nine hypotheses that could be tested. We argue these hypotheses point to the essence of issues we must explore if we are to understand how the natural system of the earth surface evolves, and how humans will affect its evolution. This paper will create discussion and interest both before and after publication.